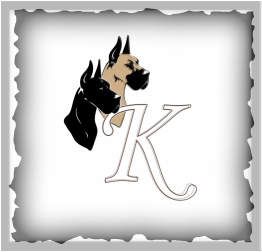 Jere and Stacie live in Fife, Washington (near Tacoma) and have been training, showing and breeding Great Danes for more than a decade. Jere has owned Danes most of his life, he got his first Dane as an adult in the early 1980's from breeder/ judge Clare Lincoln. We are members of the Great Dane Club of America, and AKC Breeders of Merit. Since we breed for show quality black and fawn Great Danes, nearly all of our Danes in our breeding program are AKC or CKC (Canadian) Champions. We fully health test all of our breeding stock. The health and temperament of our Danes are of utmost concern; testing for OFA hips, thyroid, cardiac and CERF. The puppies we produce are raised in our home with our human and canine family in a clean, loving environment making sure that each pup is socialized and cared for in a way that will ensure that they develop properly. Finding just the right home for each and every puppy we produce is very important to us. We have an application process and make sure that every puppy is placed with a family that meets our very strict criteria for a wonderful Great Dane home. Our preference is to place all of our puppies locally in the Pacific Northwest whenever possible and place our Danes within the USA and Canada only with very few exceptions. You must have a fully fenced yard for your Dane to safely play and exercise, be willing to enroll in a puppy socialization and training classes, have a lifestyle conducive to living and caring for a Great Dane, register your Dane with the AKC on a limited registration, be willing to spay or neuter your Dane (unless you commit to showing your Dane earning his/her championship) and to house your Dane in your home as a member of your family. Adopters must commit to keeping in regular contact with us for the life of your Knudtsen Great Dane family member. It is our mission to provide a knowledgeable, positive, open, patient and caring support system for all of the people that choose to bring one of our Danes into their family while always looking toward future generations striving to breed the best possible examples of the breed. Please don't take our word for the quality of Dane owners and breeders we are; visit our "words from others" link to read what others have to say about us, check our references and feel free to make an appointment to visit our home to meet us and our Danes. Think, Research and Make Sure the Entire Family is Committed to Adding a Dane First!!! Before you decided to bring a Great Dane into your family please think very honestly about the amount of time, commitment and resources you have to dedicate to a Great Dane FAMILY MEMBER! Puppies like children require A LOT of time to care for, exercise, train and love properly. Owning a Great Dane is expensive! Everything costs more for a giant dog: food, crates, bedding, medicine, veterinary care, toys, and when they chew on something with a large sharp teeth it will most likely be destroyed in seconds. Puppies can have health issues just like children; bladder infections, acne, ear infections, colds, flu..... you get the idea. As your Dane ages just like an elderly person they get arthritis, can loose control of their bodily functions, come down with pneumonia and various quaintly of life issues in their senior years. Please make sure that you currently and in the future (the next 10-12+ years) can dedicate a large portion of your life to taking care of your Great Dane family member.